Birthed from the loins of the K belwagen, which was itself descended from Ferdinand Porsche's KdF-Wagen design (known eventually to the plebes as the Beetle), the Schwimmwagen was one of the radder wee beasties of the Second World War. 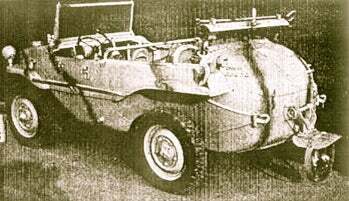 1,130 cc quadrazontal mill, a boat-type hull, low-range four-wheel drive and a swing-a-way propeller in the back made the Schwimmwagen quite the paragon of utility. We'll take two.